I have been meaning to review The History Channel's series Full Metal Jousting. It is another 'reality' television series that features the sport of jousting. This series stands in stark contrast to what the National Geographic Channel presented with their Knights of Mayhem series. Last November, I posted one blog post about that troupe. I considered writing follow up posts, but suffice it to say - things didn't get any better. The Knights of Mayhem are led by a foul mouthed egotistical man without honor. The Full Metal Jousting series is led by Shane Adams who is the leader of a professional jousting troupe known as the Knights of Valour. What's in a name? Apparently a lot. Because Mayhem vs. Valour explains the difference between the two approaches. They both use solid lances in competitions, but that's about where the similarities end. Full Metal Jousting shows sixteen different men chosen to enter a competition where the champion will be awarded $100,000. The applicants were screened beforehand to only allow those who had adequate equestrian experience to take part. Making sure that someone knows how to handle themselves on horseback is fundamental before you ask them to don heavy armor then hold and aim a lance. I have watched five episodes so far and have been impressed with the training they make these athletes undergo to learn the sport of jousting. Some were theatrical jousters with years of experience in choreographed dinner shows, but that didn't mean they would win when they were engaged in an actual competition. They split the sixteen men into two teams: the Red Team and the Black Team. Each team has their own coach. The participants have their food and lodging provided in two separate dormitories. A coin toss determined which team had control in the first round. The controlling team's coach not only chooses which of his jousters will compete, but who the competitor will be. They also have first pick of the horses. Each week shows another preliminary round, but afterward the losing jousters have been asked to remain there and continue training. There will be an additional $25,000 prize to another jouster who had been eliminated in an early round. I enjoy watching the training and the jousting. The tone of this series is professional and they have physicians on hand during the competitions to assess whether or not jousters can continue if they have been unhorsed. There appears to be real concern about injury and concussions. That's good. Glorifying injury is something that turned me off about the Knights of Mayhem attitude. I don't want to see blood and gore, I want to see good jousting. The competitions are comprised of eight passes. The first four passes use an inch and a quarter diameter, eleven foot long solid pine lances. The second four passes the diameter increases to an inch and a half. The armor was custom made for this show and were designed specifically to fit the jousters. 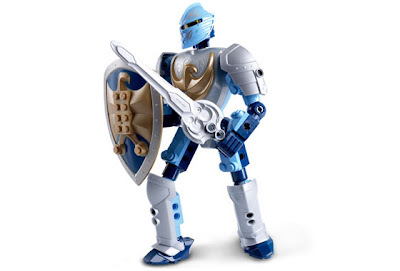 The design is modern and reminds me more of Lego's Knights' Kingdom design than it does of historical armor. Here is a video from The History Channel's website describing the armor. 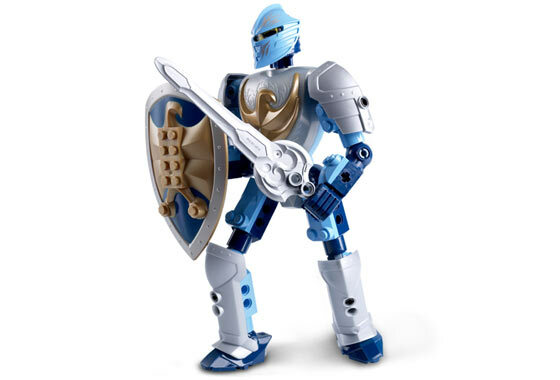 To compare this with the Lego Knights Kingdom action figures here is Jayko. In the fifth episode of Full Metal Jousting my respect for Shane Adams increased when he dismissed a jouster for abusing a horse. During practice a jouster punched his horse in the head when the horse stepped on his foot. I do not know the proper technique to get a horse to move its foot quickly, but imitating Mongo from Blazing Saddles is not it. His coach witnessed this act and immediately dressed the man down because of it. The next thing shown is the coaches from both the red and black team and Shane Adams taking that jouster aside into a private room. Shane said he had a zero tolerance for abuse of the horses. He then told the jouster to pack his things and go home. An old Arabic proverb holds that a horse is attached to its master's honor. This man did not demonstrate respect for his horse and therefore he has no honor. Abusing a horse is intolerable and I am glad Shane did not give him a second chance. Full Metal Jousting shows respect for the athletes by giving them proper training in the sport of jousting. It ensured there was adequate equestrian experience beforehand in order for the athletes to enter the process. Proper armor for each contestant was provided and safety measures are put in place to avoid/minimize injury. Shane Adams as the leader appears that his goals are to increase public attention to the sport of jousting as well as train more jousters to expand the sport. The Knights of Mayhem on the other hand did not have any such proper precautions for their new recruits. It seemed as if they just looked for individuals who were tough dudes who were looking for a new thrill, and gave them promises of riches and glory. Then the new recruits were given inadequate training as to how to handle their lances as well as inadequate attention to equestrian handling. The armor the new jousters used was borrowed hand-me-down armor that others had cobbled together. That is pathetic, because if armor doesn't properly fit it is dangerous to use. Charlie Andrews was the leader of the Knights of Mayhem and he appeared to be a bully in a sandbox. He invited others to play in his sandbox, but then beat them up when they dared touch his toys. I will continue to watch Full Metal Jousting as I find it entertaining as well as informative. Should there be a second season of the Knights of Mayhem, I shall not invite that foul mouthed miscreant back into my living room. For those interested in a summary of the episodes, I found the website Medieval Archives has posts describing what transpired as well as a breakdown of each pass in the competitions. It also looks like they have very skilled people in the list handling the horses. Those ground guys have one crazy job. In the last episode of KoM, Patrick Lambke was shown bringing "his secret weapon" of a large destrier. It appeared that he had not taken the time to get to know this horse as he was unable to control the animal. He wound up complaining and grousing that he needed a replacement steed and was actually given two different horses to ride instead of the one he owned and brought. I was appalled at this arrogance demonstrated in regard to the horses, as if they were simply vehicles to change riding without concern. In the last pass, the second borrowed horse reared and fell on Patrick. He withdrew from the tournament due to injury. There was lip service paid to the bond between horse and rider, but the actions of putting jousters on unfamiliar horses right before competition seemed to contradict that this was a real concern. In the last two episodes of FMJ we saw two different riders using the same fine horse Praetorian. The first rider was not given any practice on the animal and could not properly control him. He changed to another steed after six passes and did much better, but too late to make a difference in the match. The other rider, Rope, was a rodeo champion and he had difficulty as well, but in practice. He was able to control Praetorian with less difficulty on the day of the match. His opponent, David, then decried that he rode an old Buick while Rope drove a new Ferrari. Yep, perhaps if Patrick Lambke had taken the time to know and control his horse, he could have done just as well as Rope did on Praetorian. However, from what was shown on KoM, I was not positively impressed by his skills.